Born and raised in Brewarrina, New South Wales, Mervyn Bishop was encouraged by his mother to take his first photograph. After witnessing the 'magic' of the developing process, he became passionate about photography. In 1963 he successfully applied for a four-year cadetship at the Sydney Morning Herald, and completed a Photography Certificate Course at Sydney Technical College during these years. Bishop continued to work for the Sydney Morning Herald, and was Australia's first Aboriginal press photographer. In 1971 he won the News Photographer of the Year Award with his front-page photograph, 'Life and Death Dash', 1971. In this startling image, composition, contrast and Aboriginal social commentary combine. It is a classic example of photojournalism that has since transgressed its original context and come to insinuate the impact of religious missions within Aboriginal Australia and, in particular, on the Stolen Generations. Bishop started work at the Department of Aboriginal Affairs in Canberra in 1974, in the early years of an important era in Indigenous self-determination. Here he covered the major developments in Aboriginal communities throughout Australia, including the historical moment in 1975 when the (then) Prime Minister, Gough Whitlam, poured a handful of earth back into the hand of Vincent Lingiari, Gurindji elder and traditional land owner. 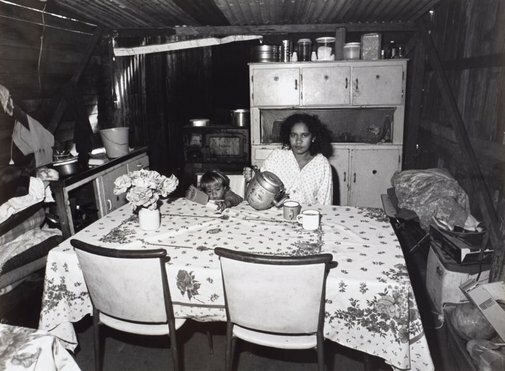 This image – representing the Australian government's recognition of Aboriginal land rights – became an icon of the land rights movement and Australian photography. In 1989 Bishop received his Associate Diploma in Adult Education at Sydney College of Advanced Education, and went on to teach photography at Tranby Aboriginal College in Glebe, Sydney and the Eora Centre TAFE (Technical and Further Education) in Redfern, Sydney. Bishop's diverse career, combining journalistic and art photography, was celebrated in 1991 in his solo exhibition and accompanying monograph, 'in Dreams: Mervyn Bishop Thirty Years of Photography 1960-1990'. This important exhibition was curated by Tracey Moffatt and opened at the Australian Centre for Photography, Sydney, before touring nationally and internationally. The timely and intimate photographs celebrate Bishop's contribution to Australian art and photojournalism. In 2000, Bishop was presented with the Red Ochre Award from the Aboriginal and Torres Strait Islander Board of the Australia Council, in recognition of his pioneering work and ongoing influence. Hannah Fink, One sun one moon: Aboriginal art in Australia , ‘Self-evident: Indigenous artists and the photographic image’, pg. 310-321, Sydney, 2007, 315 (illus.). Jonathan Jones, Tradition today: Indigenous art in Australia , 'Mervyn Bishop', pg. 32, Sydney, 2004, 32 (illus.). Hetti Perkins, Art + soul: a journey into the world of Aboriginal art , 'Bitter + Sweet', pg. 174-239, Carlton, 2010, 207 (illus. ), 281. Cara Pinchbeck, Look , 'Home: focus on the new Yiribana hang', pg. 30-31, Sydney, Oct 2012, 30, 31 (illus.). Half light: Portraits from black Australia , 'Mervyn Bishop', pg. 48-55, Sydney, 2008, 55 (illus. ).